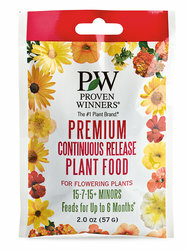 A unique 6-month formulation feeds plants continually throughout the growing season with only one application. The temperature-sensitive coating delivers more nutrients during peak growing periods when the weather is the warmestvand plants need food the most. A 15-7-15 NPK ratio is designed to maximize flowering and plant growth. Includes multiple sources of Nitrogen for strong growth and color, Phosphorus, Potassium, Iron, and all other key micro-elements to ensure peak plant performance. 2 oz. one-time use packet ideal as a value added item for hanging baskets and patio containers as well as impulse cash register aisle sales. 200 packets per case, includes 2 clip-strips.